AirPrint on iPads allows students to print wirelessly to AirPrint-enabled printers. 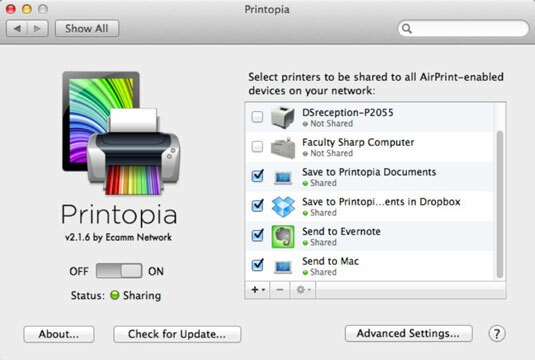 Printopia turns a Mac into an Airprint server, enabling students to print to any of its shared printers, whether or not they are AirPrint-enabled. Printopia turns your computer into an AirPrint server, allowing you to share any or all of the shared or networked printers on your network. Whether you have an inkjet printer, a laser printer plugged into your router, or a network printer whatever type of printer you have if your Mac can print to it, Printopia will share it with your iOS devices. Once Printopia is installed on your computer, go to any iOS app that supports printing and tap the Print button, and all of a sudden, all the printers connected to your computer will show up as options whether they support AirPrint or not! Download and install the Printopia software on your Mac computer. It’s available from the publisher’s website. After installation, the Printopia dialog displays the list of printers connected to your computer. All of your available printers and the Printopia virtual printers are automatically enabled for sharing via AirPrint. You can setup virtual printers that allow you to print (send files) directly to your Dropbox or Evernote among other things. Select the printers you want to make available for sharing by clicking the check box to the left of the printer name. Close the dialog when you’re done. Checked printers will appear as available printing options for iPads on the network. Select the Print option in an app on your iPad. The printers you shared in Printopia appear as print options. Easy.